There are many species of fish found on the flats of the Florida Keys. Flats fishing is commonly known by anglers as a type of fishing to catch tarpon, permit and bonefish in shallow water. There are really a lot more fish on the flats and they are all exciting to sight fish for. Silver colored with a bluish or greenish back, slender body. Proudly called the ghost of the flats. Once you fish for them you will understand why… they are difficult to see on certain flats. It works better sometimes to look for the shadow they cast on the bottom of the flat. Bonefish in the Keys range from 2lbs all the way up to double digits. The average in the Lower Keys and Key West is around 4-5lbs. Larger bonefish are around and they are more common in the upper Keys. Some say the bonefish in the upper Keys are more difficult to catch, they seem to be smart to the ways of anglers. Bonefish have a keen sense of smell and they can smell shrimp in the water from a long way off. Light tackle fisherman may chum with live shrimp to get bonefish to come across an area within casting distance. Live shrimp or a small bonefish jig work best with live bait. Fly fishing for bonefish in Key West is great in the summer months. If you don’t mind the heat, try fishing here through the summer or into October. They love foxy clouser type flies and you will want a range of weighted eyes for very shallow to deeper flats. Silver gray colored with dark blue back. 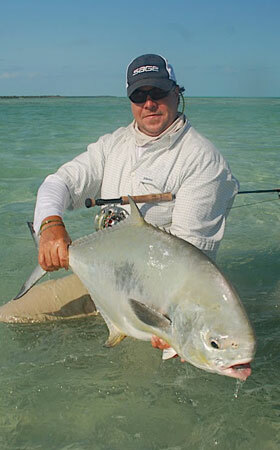 Permit are found both offshore on wrecks and reefs and inshore on the flats of the Florida Keys. The Marquesas is a popular place to fish for permit and some of the largest permit have been caught here. The average weight of permit in the Keys is around 15lbs. They have been caught up to 35lbs. We fish for permit in Key West for most of the year. Mid-April and into May the Permit go offshore to spawn on wrecks and deep reefs. They return to the flats at the end of May and into June. Light tackle fishing for permit requires a lively blue crab hooked through one of the points on his side, enabling him to swim freely. These blue crabs are about the size of a silver dollar. On the flats permit will put their tail in the air while feeding. They are scouring the bottom of grass and sand flats looking for crabs that are buried. When casting to permit on the flats, your cast needs to be very close by to ensure the permit sees the bait. The hardest part is not putting the cast too close where the permit would spook. Fly fishing for permit is by far the most challenging part of fly fishing in saltwater. Many hours are spent around the fly tying bench trying to perfect the crab fly pattern. Del Brown’s Merkin seems to do the trick pretty well, as does Enrico Puglisi’s Crab patterns. We end up tying a few new crab patterns each year. Some work, some don’t. The best study is the live blue crab we use for bait. Silver with huge scales and a bucket mouth. Tarpon is also known as “the Silver King” and when hooked he will certainly show you who is in charge with several gill rattling jumps into the air. 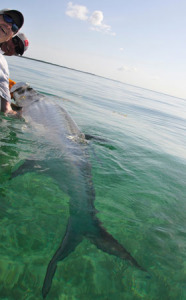 Tarpon are found throughout the Florida Keys from February through October. 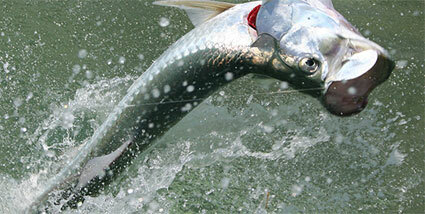 The annual tarpon migration is from April through June. Tarpon come from the west predominantly across the ocean side flats. They are strong in numbers and are hunry for bait, both live and dead, and will eat a fly readily when presented correctly. Tarpon in Key West can get up to 180lbs or more. Fish that travel along the deeper flats average around 70lbs. In Key West if you don’t fish for them on the flats or in deeper channels, you’ll find them in Key West Harbor. Fishing guides will chum for them with Shrimp by-catch and can get multiple hook ups in a day. The fight in deeper water can last well over an hour if you don’t fight the fish right. Key West has plenty of barracuda. These toothy critters range from just a few pounds to more than 20lbs. They are found offshore on reefs and wrecks and inshore on the flats. Barracuda fishing is exciting on the flats. Sight casting to a cuda and reeling a tube lure very rapidly will get a barracuda’s attention real fast. Cudas will charge a tube lure or fly that looks like a needlefish. The hook up is vicious and a barracuda will jump and fight hard. 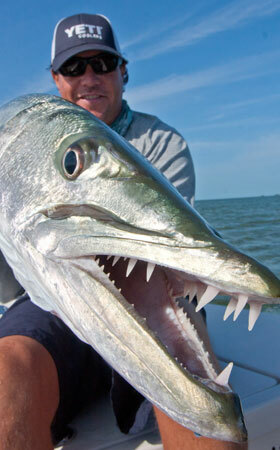 Barracuda are more active on the flats during the winter months but can be found here all year long. Sharks are spectacular on the flats. There is nothing like seeing a bull shark pushing water on a flat while half his body is out of the water! There are many species of sharks that populate the flats around Key West. They make for a great fish fight on light tackle and on fly. Bonnethead sharks look like the son of the hammerhead shark. These sharks are aggressive and quick moving. They love shrimp, crabs, and any strip bait you have to offer. Bonnethead flies are popular in rust and gray with small dumbbell eyes. The next step up are blacktip, spinner sharks and lemon sharks. These are all good beefy looking fish that fight hard and don’t give up easy. They are plentiful in the Marquesas and are more active in the winter months. The bull shark is the largest of common sharks around the Keys. The one pictured here is 200lbs. and he got so mad at us he actually bit the side of my boat. We release all sharks unharmed on my charters. 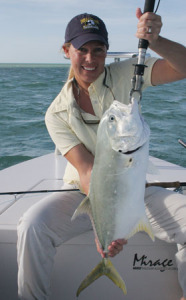 Crevalle Jack are found inshore around Key West and the Lower Keys as well as in the open ocean. They are silver with a yellowish belly. They are curious and will investigate any movement of a jig or plug lure. Crevalle Jacks like to ride with large sharks or sting rays on the flats, picking up any food that may have been churned up in the wake. They fight hard on both light tackle and on fly. Although most jacks we catch on the flats are in the 5lb. range, there are larger ones mixed in up to 20lbs.